•	Transfer the upper index loop to the middle finger so you can work on the lower index loop. •	Bring the hands together and slide the right index finger up through the left index finger loop and lift it entirely off the left index. •	Re-insert the left index finger, from below, into both loops on the right index finger and slowly separate the hands. You should now have two loops on the index fingers with two near transverse strings (i.e. strings that run straight across the figure), one far transverse string, and one pair of non-transverse strings (i.e., strings that run into the figure and cross). This complex doubled loop is now the bottom index loop and is treated as a single loop when weaving. •	Transfer the loop stored on the middle finger back to the top of the index finger. Make sure the transverse string is nearest you (i.e., don’t invert the loop during the transfers). Now you are ready to weave. Any simple two-weave pattern (without introducing any Universes) can now be formed and extended in the regular fashion, taking note that the extending string is now doubled and both should be picked up with the middle finger. But here is where the third dimension comes in. Note the transverse string running through the middle of the extended figure (fig. 19). 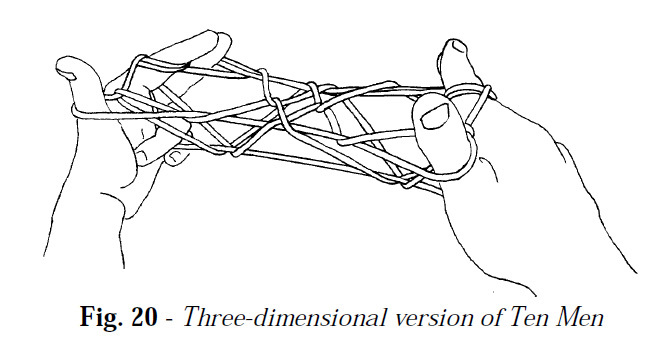 Without dropping the figure, hook down this transverse string with your ring (or ring and little finger combination) until the figure assumes a three-dimensional shape (fig. 20). as well to give a double katilluik loom. This will enrich the figure even more. •	Re-insert the left index finger, from below, into both upper loops on the right index finger, and lift them entirely off. •	Slide the right index up through all three loops on the left index (the single lower and the double upper) and lift them entirely off the left index. •	Slide the left index up through all four loops on the right index (the double lower and double upper) and separate the hands.